What could be more cheerful than playing an old Christmas record and hand rolling your own home made chocolate truffles? Nothing! If you’ve made some time to get your creative on over the next two days, then you must give this recipe a go. 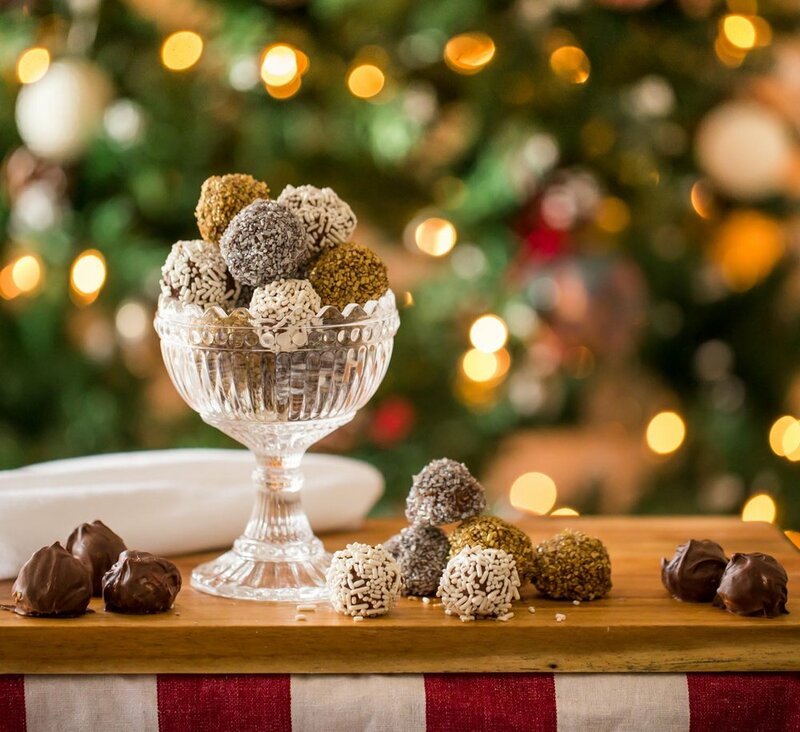 It yields at very least 60 truffles (depending on how generous you are with each pipe) and make the most perfect Christmas Day afternoon treat with tea. If you like, you can add 1 cup of nuts or cookies to the ganache. I added 1 cup of crushed Oreos for a cookies and cream type flavor. Try toasted coconut, toasted hazelnuts, or other finely chopped candy favourites. Another tip is to add a few drops of your favourite food oils such as peppermint, strawberry or lemon. Over a double boiler, combine the chocolate and cream and stir until completely smooth. Or if you prefer the microwave method: place combined chocolate and cream into a heat proof bowl and microwave for 6 minutes, stirring the mix at 2 minute intervals. Mix in your desired cup of finely chopped deliciousness and allow the ganache to set in the refrigerator until it is firm. To speed this process up, give the ganache bowl a really good stir every 5 to 10 minutes until the mixture resembles the consistency of peanut butter. If you have left your ganache in the refrigerator overnight and it is super solid, don’t fret! Microwaving the ganache in short bursts of 20 seconds will soften it up. The optimum consistency for piping is that of peanut butter or nutella. Prepare 3 large cookie trays lined with baking paper. Using a large piping bag with a Wilton 2A tip (or similar), pipe the ganache out directly onto the baking paper, around the size of a 20-cent piece. Don’t stress about the shape, just ensure they are all the same in size. Once you have piped the entire mix, place the trays in the refrigerator to set. Using a double boiler melt the dark chocolate. Remove trays of piped ganache after 15 minutes, and prepare to get rolling! Take one piped truffle at a time (which will be very firm from the time in the refrigerator), and roll between your palms until it takes a round shape. Dip in melted chocolate, and follow up with a quick roll in some sparkly sprinkles. Set aside on a clean surface and allow to rest. You might want to leave some plain and chocolately too!